Our first featured wedding venue is the last remaining building of the historic Palace of Whitehall, The Banqueting House. Designed by Inigo Jones for James I and completed in 1622, it was originally built for royal banquets, balls, plays and masques. The grandeur of the Main Hall creates a glittering backdrop for any occasion. Follow in the footsteps of kings as you walk up the sweeping stone staircase and gaze upon the remarkable Rubens ceiling commissioned by Charles I. The beautiful white vaults beneath the Main Hall were a favourite haunt of James I. Today the Undercroft can be used as a grand reception area for pre-dinner drinks or as an intimate venue in its own right. Click here to contact an AC Wedding Planner about this venue. Chelsea Physic Garden. perfect wedding venue Chelsea Physic Garden is the ideal venue for many special occasions. The Garden and its indoor spaces are suited to a wide variety of events, from large birthday celebrations, wedding parties and corporate events, to more intimate functions such as business meetings and small dinner parties. The entire site is available to hire exclusively, and areas can also be booked separately. The gardens, lawns and Gallery are all available for parties. The museum offers exclusive evening hire so that guests can explore the opulent galleries whilst enjoying drinks and canapés, or discover our Collections with a tailored guided tour. The Museum also provides a stunning backdrop for filming and photo shoots. Alternatively, the Creative Studio is ideal for meetings, away days, seminars, training and much more. The purpose-built, modern space is fully equipped with conference and seminar facilities. Delegate rates are available. The Foundling Museum is a registered charity. Income from venue hire supports our work with marginalised and care-experienced children. Harrow School is home to some stunning venue spaces. There are eight beautiful venues available here which can be used to help create your special day. All of the venues have a different character, so we are sure that you will find the one that matches your personality perfectly. The Hurlingham Club with its impeccably high standards and is an ideal place for weddings, parties and to entertain clients within the Club and its magnificent grounds spanning 42 acres on the banks of the River Thames. 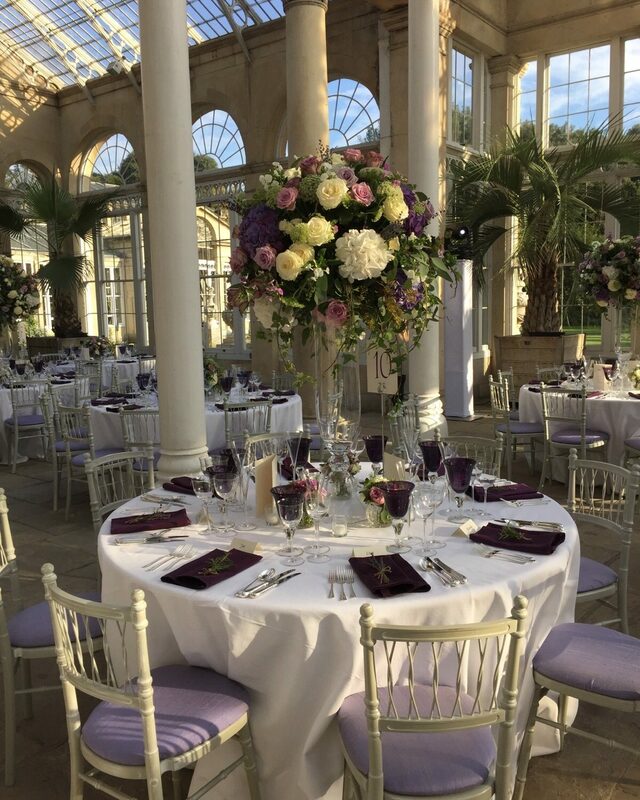 The glorious Orangery offers a romantic wedding venue and promises you and your guests an unforgettable atmosphere – and a day forever remembered. It is perhaps the world’s most beautiful orangery. Built in 1704, Queen Anne originally intended to winter her orange trees here; instead, it was frequently used as a venue for lavish balls and celebrations. Popular year-round, this romantic venue’s palatial interior décor, Portland stone terrace and tranquil surroundings make it one of London’s premier wedding venues. It is possible to book Middle Temple in its entirety or build on its’ flexibility to create a tailored combination of venues there. Such choices include hiring: The Hall in tandem with one or more of the Bench Apartments Two or more Bench Apartments together Any of the indoor spaces with the Garden and/or Terrace. One Belgravia, previously known as Il Bottaccio is based over two floors and is comprised of over 4,200 sq. ft. of event space. Able to host dinners for 200 guests or standing receptions for 400, the contemporary and natural daylight space is a perfect setting for a variety of exclusive events. This venue is due to relaunch after refurbishment in February 2016. A London Landmark rising from the banks of the River Thames, in the heart of the City, stands a striking historic building which is part of London’s heritage. Moments from Tower Bridge, this Victorian Grade II Listed building has been transformed from a world famous fish market into London’s premier event space. Given a contemporary twist by Lord Richard Rogers, oldbillingsgate now accommodates three versatile, blank canvas event spaces to feed your imagination. The distinctive Grade II listed building offers 80,000 square feet of pure potential and is available on a dry-hire basis. oldbillingsgate hosts some of London’s most prestigious events from sparkling film premiers and awards dinners, to large-scale conferences and exhibitions. Built in 1826 on its own ‘island’ in the heart of the capital, One Marylebone opened its doors as a hire space in 2008 and quickly rose to become one of the leading unique venues of London. Beautifully refurbished to the original designs of Sir John Soane, the Grade I listed venue for hire boasts three exclusive hireable spaces plus landscaped garden, moments from Regents Park. The grandeur of One Marylebone has attracted blue-chip brands from a variety of industries with a focus on fashion, beauty and the arts. Hosting a range of events from Christmas parties, exhibition space, charity events, corporate events, engagement parties and weddings. One Marylebone has recently increased the size of the Soane Hall for a sit down dinner to 350, making it one of the largest seated venues for hire in London leaving the East and West galleries to accommodate smaller numbers. Riverhill is the perfect setting for your quintessential English country wedding reception. Riverhill House is a Grade 2 listed Kentish Ragstone house set within 130 acres of beautiful gardens. The house and gardens enjoy stunning far reaching rural views across rolling parkland to the Weald of Kent. Riverhill offers couples a wonderfully romantic setting for their marquee wedding reception that blends a historic backdrop with charming gardens. Please note that we are not licenced for weddings. There are, however, many beautiful churches close by, and there are several venues licenced for weddings and registry offices in the area, where couples may marry. Somerset House is the ideal central London, riverside location with eleven venues available for your meeting, conference, dinner, reception or party. With a diverse and flexible range of rooms and spaces, Somerset House offers a wide variety of opportunities for corporate and private events and entertaining. Available for both daytime and evening hire throughout the year. Two Temple Place is available for exclusive hire for a range of events. Guests are encouraged to treat it as ‘home for a day’ and to explore the house, discovering it’s many hidden treasures. Whether you want to create an intimate wedding ceremony and dinner for 20 in the Library, a dinner for 120 guests in The Great Hall, or a standing reception using the whole house for 300, Two Temple Place is the house that delivers. The Museum is available to hire for a range of activities including meetings, canapé receptions, private views, dinner dances, filming and photo shoots.